Pakistan cricket team received a major setback as their prime spinner and super performer of the longest format Yasir Shah hit by an injury just before the tour of Ireland & England. Yasir’s injury is a great cause of concern for Pakistani think tank as there is no immediate replacement of same caliber available to fill the void created by Yasir’s absence. Pakistan team management must need to look after their premier bowlers as Yasir’s injury is clearly result of excessive usage in trying conditions which has taken adverse effects on Yasir Shah body who has already crossed 30 year of age bracket. 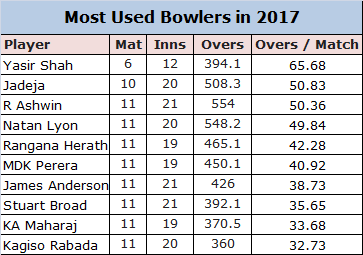 If we look at the below statistics based on bowlers work out during a test match than you will that Yasir Shah has bowled most number of overs per test match during 2017. Although Pakistan have played less test matches in comparison to other top teams but now a days as tour itineraries are prepared with lesser gaps between the matches means bowler need to gather the same level of energy and strength in lesser time in order to get himself prepare for competitive cricket once again. Asian teams probably more inclined towards use of spinners specially when playing in sub-continental pitches. Interesting fact which is visible from the below table about work load management done by other teams who are heavily reliant on spin bowling. India, Srilanka & Bangladesh all has fielded two spinners mostly to manage the burden of bowling whereas Pakistan missed a trick by only playing with Yaisr Shah most of the times and use him excessively in search of wickets to gain the advantage. If you only look at Pakistani bowlers who bowled most overs in 2017 than you will find Yasir Shah with all other fast bowlers who have tried their heart out to support Yasir but couldn’t prevent him from an injury. In recent times we have also seen likes of Mohammad Amir also complaining about more workload on him as he has bowled most number of overs for Pakistan in test matches after Yasir Shah. Pakistan team management must need to look at it for upcoming tour to save burnout of premier fast bowlers before World Cup 2019. Previous Article Did you know about the bowling record of Waqar Younis ?? Next Article Who can replace Yasir Shah on England Tour ?